When we started Conquering Clutter, we knew we were on to something very special. We believed that our passion for quality craftsmanship, along with over 20 years of custom closet organization/cabinet building experience, is what would make all the difference in the world – and it has. It’s the difference between acceptable and exceptional, common and one of a kind. It’s the difference between Conquering Clutter and all the others. Our passion is to help make your life more efficient and enjoyable by providing intelligent custom storage solutions that put things in their proper place. Our professional design team can create a personalized plan for any area of your home at no extra charge. From our FREE in-house evaluation, to our trained staff of experienced custom closet designers, Conquering Clutter is the best choice when designing your custom closets. Custom closets for your bedroom can be anything from walk-in and reach-in closets to traditional wardrobes. We can help you turn a cluttered bedroom into a restful sanctuary. Our new bathroom sliding shelves organizes things so everyone can calmly find their hairbrush, even during the hectic morning rush hour. Custom blinds & window treatments can change the look of any room with choices to suit any style. Their versatility makes them desirable for both traditional and contemporary decors. But today’s custom garage storage solutions offer homeowners the garage organization necessary to create space to work as a workshop, an extra room, or even a place to store your wheels. Designed to slide out from cabinet shelves as if they're gliding on glass, our innovative pull out drawers give you easy access to all of your kitchen items, large and small. Whether trying to get the most out of a compact cooking space or keeping things within reach in a large kitchen, kitchen organization is what you need to keep any mess hall under control. “Choosing Conquering Clutter was the perfect solution for our custom closets. The big franchise closet companies could not work with our limited budget. But Conquering Clutter gave us both. 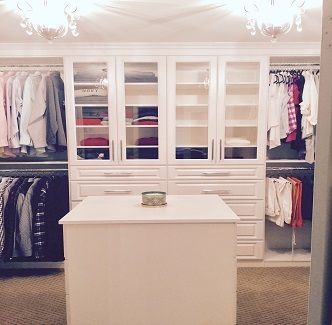 What made the whole process for our custom closets work so well was my designer, Robert. His experience, professionalism and knowledge of organization helped streamline the process for our Custom Master Closet."